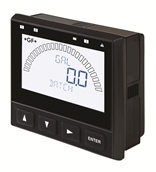 GF Piping Systems has introduced the second generation Signet 9900 Transmitter featuring a Batch Controller option, along with all the proven features of the original model. The new Signet 9900 Transmitter (Generation II) supports multiple parameters that include flow, pH/ORP, Conductivity/Resistivity, Salinity, Temperature, Pressure, Level, and 4 to 20 mA Signals, and also Batch Systems. Customers can convert their second generation 9900 Transmitter to a Batch Controller System by simply plugging in the new Batch Module and Relay Module, thereby maintaining the product’s original intent of consolidating multiple platforms into one while increasing their service level and reducing inventory. The 9900 features an extra large (3.90” x 3.90”) auto-sensing backlit display that allows visibility at 4-5 times the distance of other transmitters. This highly illuminated display and large characters reduce the risk of misreading or misinterpreting the displayed values. The display shows separate lines for units, main and secondary measurements as well as a dial-type digital bar graph. Output accuracy is ±32 μA maximum error @ 25ºC @ 24 VDC with resolution of 6 μA or better. Other capabilities include relay and warning LEDs, and an intuitive menu for easy programming. Standards and approvals include NEMA 4X/IP65, CE, UL, CUL, RoHS and China RoHS. The new 9900 Batch Control System is well suited for batch processes, filter backwash initiation, chemical addition, and canning and bottling. Other applications fulfilled by the 9900’s multi-parameter capabilities make it ideal for water and wastewater treatment, reverse osmosis, deionization, chemical dosing and delivery, metal and plastic finishing, fume scrubbers, cooling towers, and all types of filtration.